Now for the second part of my little exploration into moisture in tea and coffee. This time I’m focussing on coffee. Unlike tea, there is a lot written about the impact of moisture on coffee and this splits generally into two issues. One is the growth of fungi, a favourite topic in my blog articles, and the other is an effect on flavour that makes coffee taste bitter. Have you heard about either of these two issues? There is a very good chance that you have…..
Before I talk about either of the two moisture issues, it makes sense to go through how coffee is produced to see how moisture leads to problems. What we know as coffee “beans” are the seeds from inside the fruit of the coffee plants. When the fruits of the coffee plant, called “cherries”, turn from green to red they are ready for picking. Two methods are used to get the coffee bean out of the cherry. One method is the oldest and most “natural” and called the “dry” method. You can probably guess what the other method is called, it is the “wet” method and needs, not surprisingly, plenty of water. In the dry method the cherries are laid out in the sun to dry naturally. On larger plantations the drying step is finished off in a dryer. When picked, the skin of the cherries is like that of an apple and also, like an apple, it has a wet pulp under the skin. Drying makes the skin of the cherries hard and brittle and the pulp loses its moisture. 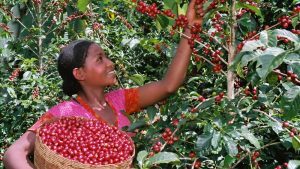 Experience over many, many years of coffee production has resulted in a target moisture content of 11%, with a maximum of 12.5%, as the point to stop drying. Dried cherries are then sent to a mill for “hulling”, to remove the skin and pulp from the “green coffee” bean. The green beans are stored and then shipped to the coffee manufacturers for roasting. If sufficient water is available, and this means the equivalent of several litres of water to make enough coffee for one cup, the “wet” method can be used. In this method, the first step is mechanical pulping of coffee cherries in water. Pulping the cherries releases enzymes into the water that start to breakdown the skin and pulp. After the required number of hours of “fermentation” the green beans are separated from the skin and pulp. The green beans are then washed and dried to the same moisture content of 11% as in the dry method. A final hulling and polishing step is needed at the end of the wet method to remove a thin skin, called the “parchment”, from the dried beans. Two quite different routes to process coffee cherries to get the green coffee beans but both ended up with the beans ready for storage and shipping with a target 11% moisture content. I wonder if, like me, you never realised how complicated making coffee is? Moisture is just another factor adding to this complicated process. Coffee beans, just like tea that I talked about in the first part of this blog post, naturally take up moisture. If you leave coffee beans sitting around they adsorb moisture and their weight increases. Commercial coffee makers who buy green coffee by weight do not want to pay for water. So the amount of moisture in the coffee beans is tested and controlled for shipping. Another reason for controlling moisture in coffee beans is the impact on flavour. Over drying the beans removes some of the flavoursome oils and therefore adversely affects the flavour. In the opposite direction, if the moisture level gets above 12.5%, the taste becomes bitter. Coffee contains over 1500 substances and these can change chemically when interacting with water to become other substances that taste differently. Unfortunately, the chemical changes do not enhance the taste but are picked up on our tongue as being bitter. The moisture effect gets worse as time passes. And it’s not just the green coffee beans that are effected. After roasting, which of course dries the beans, they are even more likely to pick up moisture. I explained why this happens for dried tea in Part 1 of this article, and it is just the same type of effect in coffee. This change in taste is not a trivial matter. More often than not, I have to add a bit of sugar to the cups of “freshly ground” coffee I buy in coffee chain outlets. I won’t name them but you’ll know the ones. Having given up putting sugar in my tea and coffee for over 40 years, it is with great reluctance that I add a little sugar to my coffee. 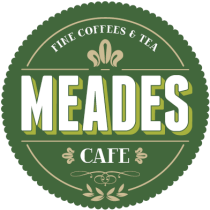 On the positive side, one place that rarely disappoints, is our local Meades Café in Dungarvan. I really must enquire how they manage not to offer up bitter coffee. An ex-colleague used to get into a “disagreement” with his wife about how to store ground coffee. His wife insisted that the coffee kept better in the fridge and would go off if not refrigerated. He on the other hand claimed that the coffee became bitter if kept in the fridge. The problem is that with so many different compounds in coffee, how one’s person’s taste is affected by some change in these substances could be completely different to another person’s taste reaction. It is well documented that moisture uptake makes coffee bitter, so my guess is that the coffee in the fridge picks up moisture and my ex-colleague taste buds are particularly sensitive to the chemical changes. I’ve written before on this blog about moisture increasing in the fridge because of its lower temperature and in my free eBook A Wet Look At Climate Change. A third problem with moisture uptake in coffee is that the natural green coffee beans pick up fungi from the cherries when they are removed using either the dry or wet methods. As I said at the beginning of this article, fungi and moisture is a favourite topic of mine. But in this case I’m slightly ducking the fungi issue. In the media there has been a lot written about fungi on coffee producing toxins that are pretty nasty for humans. Agreed, increasing moisture to above 12.5% of the weight of the green coffee beans allows these fungi to begin to grow. However, coffee producers control the moisture content by commercial necessity as I described above and that level for control limits the opportunity for the fungi to grow. Given the millions of tons of coffee shipped every year, I’m surethere is no great problem with fungi and the safety of coffee. I’m not worrying about it and not going to let it get in the way of me enjoying a cup of coffee wherever and whenever I like. So long as it’s not bitter! If you know different. Please let me know. Like to hear more about the impact of moisture all around us? Please sign up for email alerts of my blogs. I like your perspective. I have never thought about the world from the angle of moisture. The growth of fungi is way overrated in my opinion. Fungal spores are everywhere, all the time. We breath them in and eat them. If they were so harmful to us then they would have killed us a long time ago. Have a great day and enjoy the coffee!